Here in Australia, we're famous for giving things, places and creatures goofy names. I mean, just pick one letter. Wagga Wagga. Wallabies. The Wollemi Pine. Wollongong. 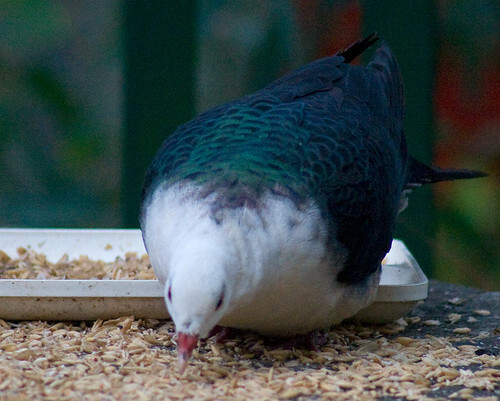 So, when a rather rotund bird I'd not previously seen showed up at our feeding table, I was optimistic. Surely, this plump creature with its habit of thrusting out its neck comically would have a ridiculous name. Could it, perhaps, be a Wonga Pigeon? Wait - perhaps it was a Wompoo Fruit-Dove! 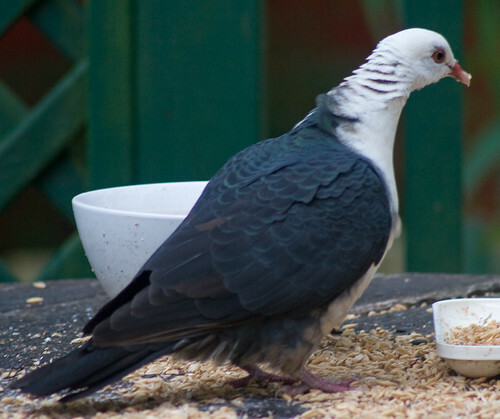 But then I found out that this white-headed pigeon is actually... a White-headed Pigeon. Remember that you can call Wagga Wagga Wagga, but you can't call Woy Woy Woy. Don't feel too bad - I would have been quite impressed if it had been either of those two W birds. Wongas are a cute, dumpy little Pigeon. They're also notoriously hard to get a good photo of, because they never bloody stop walking. I was also pretty lucky to spot a pretty Wompoo on my travels. It's disguised in the middle of that photo (I didn't have a zoom lens at the time), and I never would have seen it if it hadn't been making its distinctive Wompoo-like call at the time. The cats actually treat it more or less like TV. Sometimes they're all excited and making little noises at the window, but a few minutes later they're doing something else.